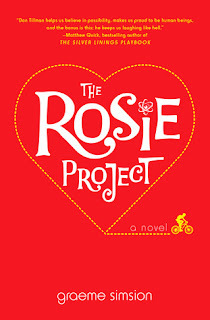 I had been wanting to read The Rosie Project for awhile because it did have quite the hype surrounding it. I remember when it came out, at least in Canada, I received multiple emails regarding it and saw it on every HOT list. I really should realize by now that good PR doesn't necessarily mean I will agree. Now don't get me wrong; I did enjoy this book a lot but I don't think it necessarily deserved all of the accolades it received. The book was well written with a very interesting perspective on things as it dealt with someone with some obvious social (or perhaps mental) issues trying to find a wife. The main character reminded me a lot of Sheldon on The Big Bang Theory - someone who believed in the power of science in every situation and even tried to apply it socially which didn't work out in his favor a lot of the time. I found myself questioning whether or not he was autistic. I am not sure if the book mentioned it and I went back to see if it did but couldn't find it. I am pretty sure it was what they were alluding to but I couldn't be quite sure which sort of bothered me as I like to know the facts. The story itself was quite charming in an awkward way but I suppose that was probably the point. Despite the almost strange and uncomfortable feeling the story gave me at times, Don was very likable despite himself and I found the pacing of the book to be excellent. The story flowed very naturally and I also enjoyed how things came together at the end which is a very important detail to me. The Rosie Project probably isn't for everyone as you would have to enjoy something a little offbeat, but it was a good read that was a little out of the ordinary just like Don himself.